The work of the Saint is impressive both through its dimension and through its content and it includes in the new critical edition five considerable volumes (the sixth volume contains indexes for the whole work), each volume totalizing over 400 pages. The contemporary researchers consider Saint Neophytos as the most prolific Byzantine author of the twelfth century after the canonist Theodor Valsamon. The first volume, which was just published by “Doxologia” Publishing House, includes two major works: an interpretation of the commandments of our Lord Jesus Christ in the Sermon on the Mount, entitled Ten Words about the Commandments of Christ, his first writing in chronological order, and a second writing entitled Fifty Chapters (Pentikontakefalon), which reaches biblical and theological subjects such as Job’s patience, the fall of our forefathers, Cain’s sin, and also an exegesis on the Song of Songs in eschatological vision, meditations upon death, etc. The translation from old Greek to Romanian belongs to Laura Enache, a renowned translator of patristic and Byzantine Greek, member of the Writers’ Union of Romania. The introductory studies have been done by Professor I.E. Stephanis and Professor P. Sotiriadis from Thessaloniki, the editors of the critical text, and have been translated to Romanian by Doru Octavian Vasile. 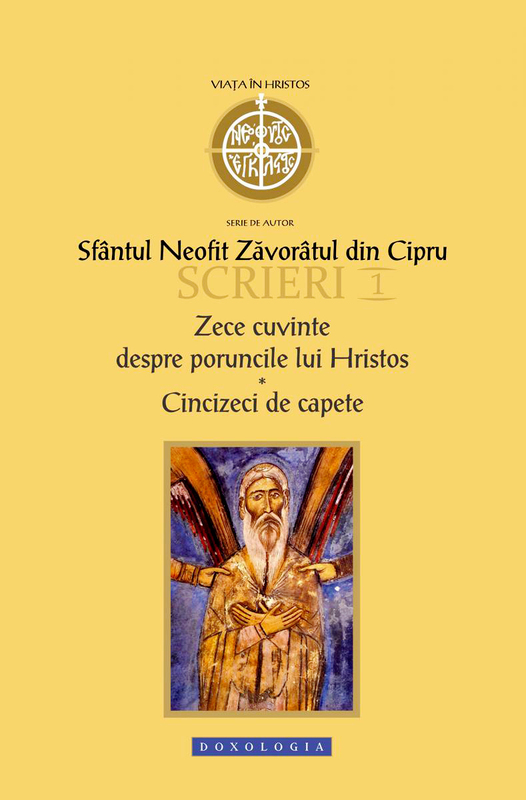 The Romanian edition of this first volume was edited by Father Dragos Bahrim, who is also coordinating together with the Byzantinist Petre Guran the author series that is dedicated to Saint Neophytos. It should be mentioned that the entire Romanian edition has benefited of the fully support and generosity of the Saint Neophytos Monastery of Paphos, especially of His Eminence Leontie, the Abbot of the monastery, who constantly encouraged and supported our effort.